NATURE IN ALL ITS BEAUTY AND MYSTERY, MAN IN ALL HIS BEAUTY AND MYSTERY. REALITY IS MORE IMAGINATIVE THAN FANTASY, REALISM IS BASED ON FANTASY. HIS SURREALISM IS " SURREAL MYSTIC " .OF LATE, BECAUSE OF HIS TECHNIC AND CREATIVE QUALITY HE HAS BEEN INCLINED TOWARDS THE CLASSICAL-RENAISSANCE STYLE . HE HAS ALSO BEEN DRAWN TOWARDS THE SURREAL EXPRESSIONISTIC STYLE . IN HIS JEWELRY NATURE SERVES AS A MAIN INSPIRATION SOURCE, STYLE AND TECHNIQUE ARE SCULPTURAL ,MATERIALS USED ARE GOLD ,SILVER ,STEEL AND GEMSTONES. 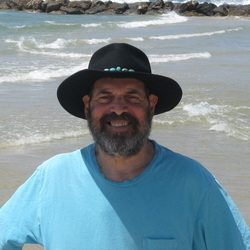 BORN IN ISRAEL IN 1946 . GRADUATED FROM TEL AVIV ACADEMY. IN THE LAST 40 YEARS LIVING IN EUROPE : DUSSELDORF ,PARIS ,AMSTERDAM AND NEW YORK. HE EXHIBITED HIS ART IN GERMANY , HOLLAND, AND FRANCE. NOW HE IS LIVING AND ACTIVE IN ART IN TEL AVIV ISRAEL.